I call this kinesthetic learning and it can be done without my underlying resentment and my occasional tendency to yell and yes, it is part of this very cool game! I know that so many things have changed in this world as compared to the days when I was a kid. Oftentimes we say, "In my day, we had rotary dial! Now, kids are just texting!" These observations usually appear as usually as complaints. However, there are certain things that show at least to me that we have made some changes for the better and believe it or not, I think it is in the form of teaching children emotional intelligence. For example, "Just ignore them" didn't solve too many problems but it was something that parents said ALL THE TIME back in my day. He's making fun of me. She doesn't want to be my friend anymore. Well if everyone jumped off the Brooklyn Bridge...... (substitute the name of closest & largest bridge to your city). I believe that sometimes, these answers can be okay but I also think they are usually not meeting the true needs at hand. Sometimes when kids get upset, I think it's because they get lost. They forget or just do not realize what is most important. I try to teach my kids what is important but the sad part is that it is usually when we are in a crappy situation. Teaching them principles about sharing, saying what is on their mind, prioritizing, having self-control usually happen during or after they have made a huge mistake. I don't know about you but I have a feeling that my kids like to forget their mistakes because it lessens the pain quicker. But those clouds of lecturing and admonishments that surround them would likely get buried along with it. I did however, find one way to avoid this depressing mode of teaching. What Happens When Mom Talks About Herself? I sometimes tell stories about when I was a kid. For some reason, they miraculously give me their full attention when I tell them about how I got run over by a car when I was little because I wanted to win so badly in a daily race to beat my brother home from the school bus stop (lesson: winning isn't everything). I told Number 1 about how I apologized to my boss' boss on the phone instead of sending an email because it is easier to rip someone via email than on the phone. (be confident & face up to your challenges). I told Number 1 how I didn't have enough socks when I was in first grade because my parents didn't have so much money and how I had to stay at home alone with my brother (just 2 years older) until my mother came home at 7 PM (think about everything you have- it's a lot). 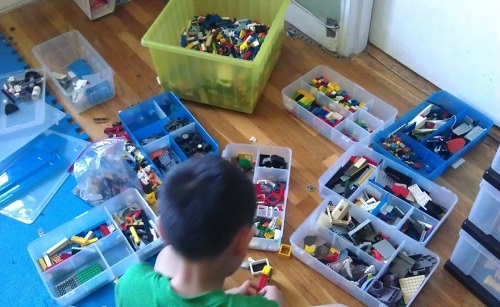 This kind of stuff always gets my son's attention but as you can imagine, I don't have much time for this. You also have to be in the mood for storytelling and storylistening. As we all know, many parents and to an extent educators as well all have these issues. We can't have deep or even semi-deep conversations anymore. I have been to countless workshops where I've been taught how to open up a conversation with your child. "Do not ask them Yes/No questions... Rather say, 'I wonder what....'" It's not like it doesn't work. It's just that I forget and those one or two tactics I do remember can only get me so far. So how do we make talks more talkative? Well, we'll just have them win points to get what we want out of them. Of course! Come on, you didn't know that? You never played Super Mario Bros.? I have never purchased any "7 Habits of Highly Effective"- anything in my life. It's not like I don't own self-help books. I just never got to this series. Around the time when I saw a lot of these titles, I think I was reading, "Men are from Mars..." books. 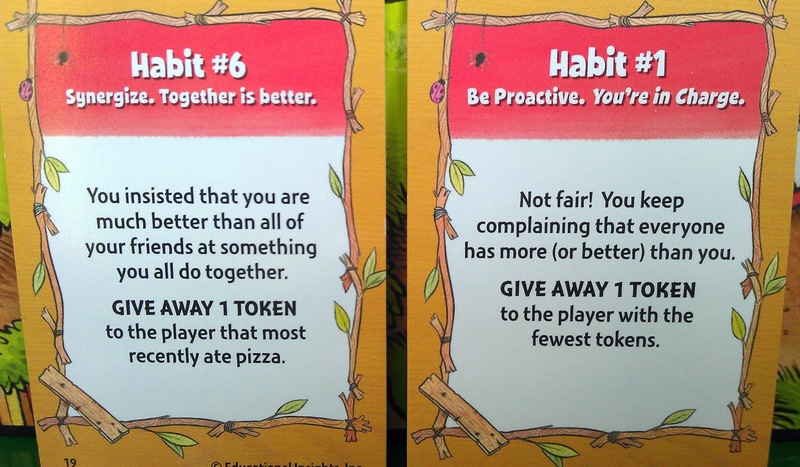 But at the Toy Fair this year, I stopped by the Educational Insights booth and was shown this game, "The 7 Habits of Happy Kids," based on the book with the same title, authored by Sean Covey (son of Stephen Covey). Could this possibly be fun? 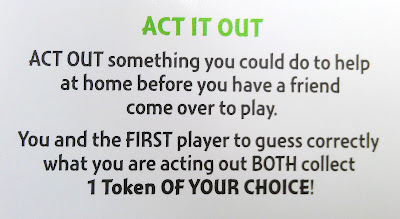 Could it be all my nagging and lecturing packed nicely in a board game? Would my kid go for it? To me, all I see is one very busy family. That is me in the middle multitasking. 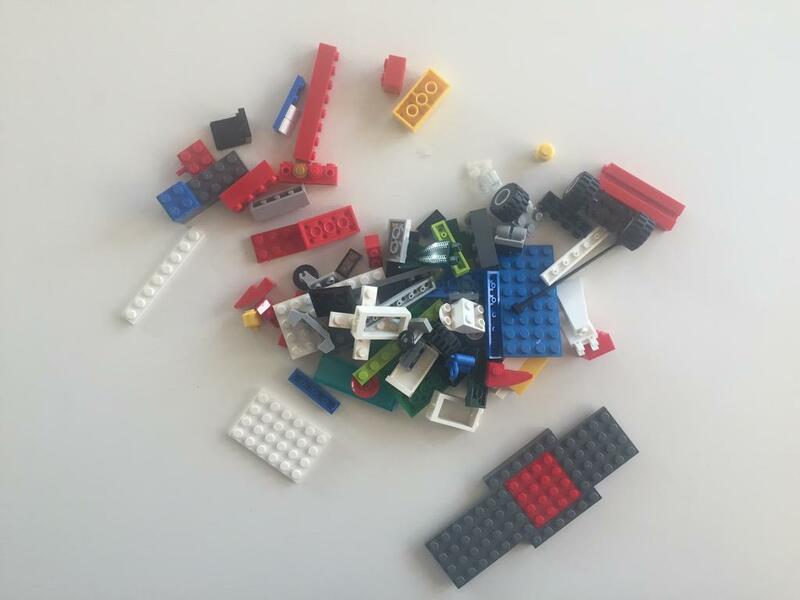 When I showed Dr. Heather Goldman, child psychologist and Psychology Consultant at The Quad Manhattan, a video that described the game featuring Sean Covey, she was very interested in playing with it as she saw that the game could touch upon many skill areas that are important to a child's development, especially that of a child being able to think and reflect. Dr. Goldman agreed with the messages that Sean Covey addressed in his video (family members are too busy to talk with one another). As an example, she said that many of the parents with whom she works often have the same complaints about the usual questions they ask, "'So how was your day? What did you do in school today?'" Dr. Goldman continued, "and you have some kids give you a one-word answer. They don't really want to talk about it." Dr. Goldman played this game with one of her students, an 8-year-old girl. At the end of each meeting, she would always ask Dr. Goldman if she could play 7 Habits of Happy Kids again with her. Dr. Goldman saw how her student liked talking about and reflecting on her experiences. Going back and reflecting are skills that she feels is very important for children and helps them problem-solve. "Because if something, let's say, wasn't so easy for you, or you didn't necessarily know what emotion you had that was connected to an experience," she continued, "having a conversation after the fact gives you a little distance and a little room to have perspective on it and possibly think more about it." Additionally, Dr. Goldman said that she could see how this game could be very much enjoyed if there were more children, such as social skills groups and in family living rooms as well. Another aspect Dr. Goldman enjoyed were the various tasks that were asked of players. 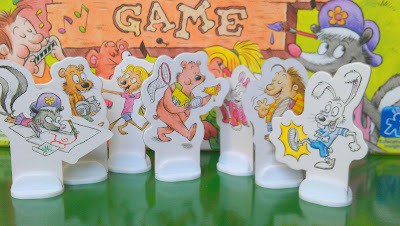 Singing, acting out, recalling/storytelling, and even drawing are ways to win the tokens that required to win the game. This, at one point, actually presented a tough situation for the student playing with Dr. Goldman. The child had to draw out an answer and have Dr. Goldman guess it. She was very reluctant to do it because drawing is not her strong suit. Dr. Goldman took this opportunity to explain that no one is good at everything and that even she herself was not skilled in this area. Dr. Goldman happily concluded, "she opted not to skip." The child had been hard on herself but Dr. Goldman successfully guessed her answer to the child's delight. I am so grateful this game was created. Unlike my Charlie Brown-esque lecturing when they get into big trouble, we can discuss things when they are happy and feeling positive. That to me, shows true respect for children as individuals. Because these habits are ideals that I want my kids to keep in mind constantly, I can see us playing this game even when they are pimply and when cellphones are obsolete because we all text via electronic telepathy. It's one of those games that you'd keep and never give away even if it goes for a few months without playing. The principles discussed are also thoughtfully presented. 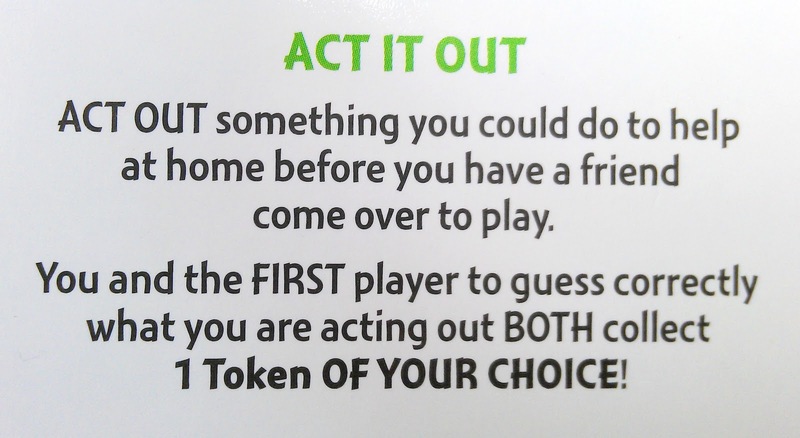 Oftentimes, a fellow player is able to earn tokens while collaborating with another player whose turn it is. 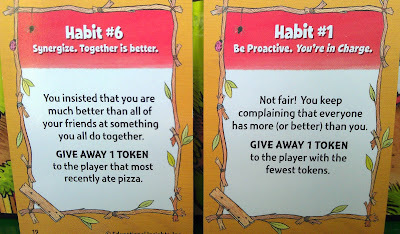 Additionally, there are "giveaway cards" in which you lose tokens in a comical way while sneaking in lessons that discourage familiar but unwanted behavior such as stubborness, apathy, forgetting to say "thank you," and stinginess. Again, giving time to talk about these things when people are in a good mood is an excellent strategy in my book. Additionally, I think that grade school is an excellent time to introduce these habits. 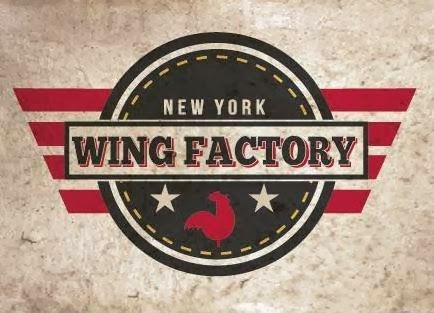 You might think that something like "Think Win-Win" (Habit #4) sounds too much like office talk but my primary concern for my kids from an educational perspective is not college, state proficiency tests, or even SATs. Rather, it will and always will be about the end goal: GETTING A JOB - a good one in which they will look forward to going to work everyday. There are so many people with college degrees and no job. I know some really talented people out there with graduate degrees and are eking by on part-time salaries while doing full-time work. Okay, so how badly would you like to give this card to your child? HA! This is all just part of a game so there is no shame and no tears. You just learn, laugh, and move on. But even if working and careers weren't on my mind, there is also the other side of life that is even more important. That is the self and family. I think about how my kids will be parents (especially when they mimic one of my bad parenting tactics). If they get married, I really want them to choose a good spouse. I want them to have good friends too, right now, and in the future. This game really surprised me. I never imagined that a game that taught emotional intelligence to children could be so openly and cleverly presented. Famous or not, the fact that the characters and other details within the game are based upon the author, Sean Covey's real life, is something that many children can and would appreciate. 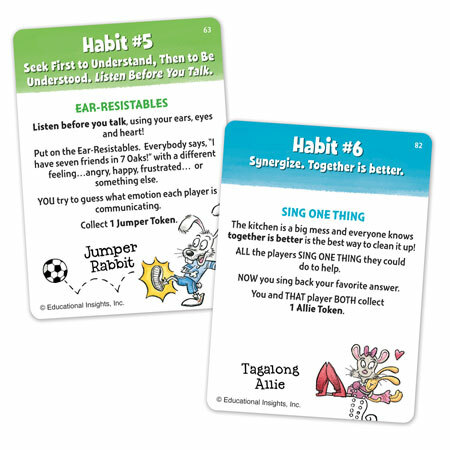 As for me, a mom, playing this game piqued my interest in good habits as a family and so I found my self on Amazon buying the book written by Sean Covey's father, Stephen Covey, The 7 Habits of Highly Effective Families. While I have purchased my share of self-help and parenting books in the past, this is very likely the first time, I have ever purchased a book about changing and improving as a family. I suppose these habits are slowing sinking into me too, especially one that is very hard for me: Habit #6- Synergize: Together is Better. 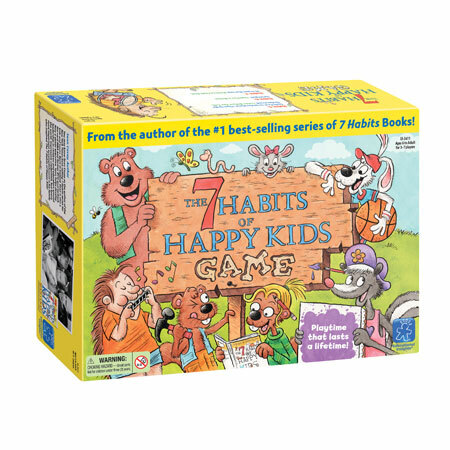 Educational Insights would like to give one 7 Habits of Happy Kids Game to one lucky winner. Will ship to addresses only in Canada and the United States. You must be 18 or older to enter. Please make sure you follow the directions to ensure your entries will be valid. 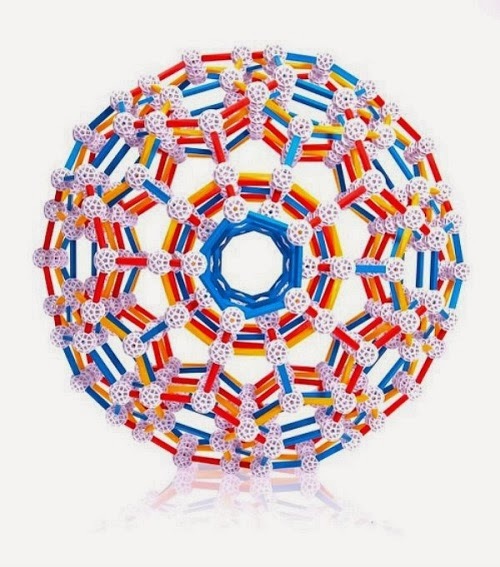 Disclosure statement: Toys are Tools has not been compensated in any fashion by the manufacturer or retailer of any of the mentioned products for the publication of this post. Dr. Goldman and I were both provided with one game each for our review. Reviews are never promised. The video was embedded with the permission of Educational Insights. This game really looks like something my family could use! Thank you so much for the review, it's always nice to find something that is truly useful that others have used. I'm so glad you posted this! I've read the book Emotional Intelligence, and in the book it talks about some programs for children that are really making headway. I have been wondering how to incorporate that into our lives. This is definitely getting shared. Love this! I've been looking for something just like this for my kids. And, I love grown ups get to share their stories! Thank you! "Singing, acting out, recalling/storytelling, and even drawing are ways to win the tokens that required to win the game." is what had me saying, "Yes!" I LOVE that the game not only teaches life skills, but does so while playing into the strong suits of many children. I have never heard of this game before, but now have it on my lost. What a really neat concept for a game! I love it! I would so love to win this for a friend of mine. Her family would LOVE this. Thanks for your amazing, thorough and thoughtful review, you really spent some it and having the psychologist use the game and review it too,was brilliant. Speaking of time, we literally spent years developing it, so you cannot know how much it means to hear this positive feedback and comments. We are so grateful! 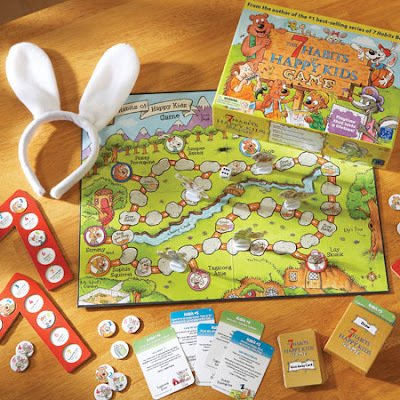 Laura Robinson and Elizabeth Bryan , inventors of the 7 Habits of Happy Kids game.